On Jan 31, The US Secretary of Defense (SecDef) James Mattis spoke with ROK Defense Minister Han Min-koo on the phone and shared their assessments about security in Northeast Asia. They also committed to strengthening the two countries’ response capabilities against North Korea’s nuclear threat.1 A few days later, SecDef Mattis flew to Seoul to meet with Defense Minister Han, Prime Minister (PM) and Acting President Hwang Kyo-ahn, Foreign Affairs Minister Yun Byung-se, and Blue House National Security Chief Kim Kwan-jin2. There was significant media coverage in Korea on the Secretary’s visit since this was the first regional visit by a high-ranking cabinet member of the Trump administration. Many Koreans, including government officials, saw it as a symbolic gesture by the US3 to reaffirm the importance of the alliance while sending a strong message to North Korea and China. Former UN Secretary General Ban Ki-moon, one of the favorites in the upcoming president election, withdrew his candidacy on Feb 1. During the press conference, he pointed to the scathing attacks on his personal character and his family among his reasons for the withdrawal.13 Until this announcement, Mr. Ban was widely considered to be the leading candidate from the conservative side, only second in public support behind Mr. Moon Jae-in. Ban’s withdrawal leaves the conservative side without a clear leading candidate. 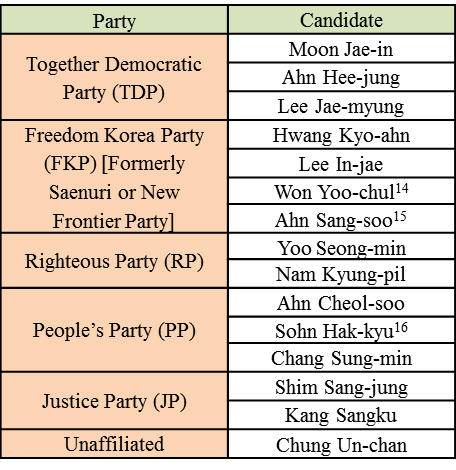 Yoo Seong-min, the former anti-Park member of the Saenuri Party and candidate from the Righteous Party, is also being discussed as a leading conservative candidate. 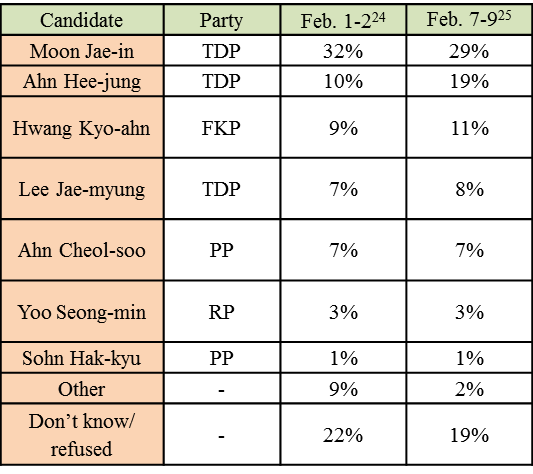 However, he is rather unpopular among older voters, who are extremely conservative and pro-Park. “한민구 국방장관, 매티스 미 국방과 통화 ‘강력한 대북 메시지 전하는 계기 될 것’,” 중앙일보, 2017년 1월 31일. “매티스 美 국방장관, 다음달 2일 방한…한미 국방장관회담 갖는다,” 중앙일보, 2017년 1월 31일. “매티스, 첫 방문국은 한국 … 북핵 중국 동시 견제 포석,” 중앙일보, 2017년 2월 1일. “매티스 美 국방장관 ‘트럼프, 한·미동맹 최우선 생각’,” 중앙일보, 2017년 2월 2일. “매티스-황교안 ‘사드 배치 계획대로 추진’,” 한겨레, 2017년 2월 2일. “매티스 ‘사드배치 유일한 이유는 북 미사일’,” 동아일보, 2017년 2월 3일. “한민구 만난 매티스 ‘북핵 등에 압도적 대응할 것,” 한겨레, 2017년 2월 3일. “매티스 ‘중국이 北을 자산 아닌 부담으로 느끼게 하겠다’,” 조선일보, 2017년 2월 7일. “軍 ‘북한 동해상으로 미사일 발사, 트럼프 행정부 겨냥한 무력시위 가능성’,” 동아일보, 2017년 2월 12일. “북한 ‘중장거리 탄도미사일 ‘북극성 2형’ 시험 발사 성공…새 전략무기체계’,” 동아일보, 2017년 2월 13일. “美 플린-김관진, 전화 통화 …북한 미사일 대책 논의,” 동아일보, 2017년 2월 12일. “정부 ‘북한, 핵 포기 않으면 생존 못하게 만들겠다’…규탄 성명 발표,” 동아일보, 2017년 2월 12일. “반기문, 대선 불출마 전격 선언 … ‘순수한 뜻 접겠다’,” 동아일보, 2017년 2월 1일. “與 원유철, 6일 대선 출마 공식 선언 … ‘든든한 대통령 되겠다’,” 동아일보, 2017년 2월 3일. “원유철 안상수, 대선 출마 선언 … 새누리서만 9명 나오나,” 조선일보, 2017년 2월 7일. “안철수 손잡은 손학규 … 대선구도 재편 급류,” 한겨레, 2017년 2월 7일. “원유철·안상수, 대선 출마 선언… 새누리서만 9명 나오나,” 조선일보, 2017년 2월 7일. “황교안, 반 지지율 흡수하나…대선 지지율 3위 ‘껑충’,” 중앙일보, 2017년 2월 2일. “야당 ‘황교안 출마하나” 30차례 추궁 … 황 대행 “지금 업무에 최선’ 비켜가,” 중앙일보, 2017년 2월 11일. Gallup Korea, date: Feb. 07-09; sample size 1,007; margin of error: +3.1 at the 95% confidence level. “민주당, 내달 13일 대선 후보 결정,” 중앙일보, 2017년 2월 2일. “김종인, 대선출마 여부 묻는 질문에 ‘답변 미루겠다’,” 조선일보, 2017년 2월 10일. 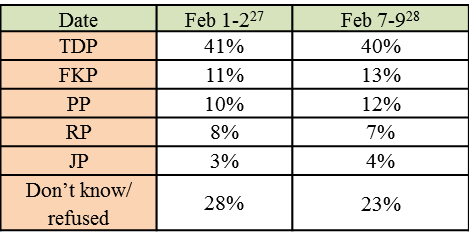 Gallup Korea, date: Feb. 01-02; sample size 1,003; margin of error: +3.1 at the 95% confidence level. “‘23일까지 최종 의견서 내라’ 헌재, 대통령·국회측에 통보,” 조선일보, 2017년 2월 10일. “박근혜 대통령, 헌재 최후통첩에 최후진술 검토,” 세계일보, 2017년 2월 9일. “특검 ‘자진출석 최순실 묵비권…질문에만 관심’,” 한겨레, 2017년 2월 9일. “특검, 수사기간 연장 신청 방침… 탄핵심판 시기도 고려,” 한국일보, 2017년 2월 7일. “‘특검 연장’ 카드 꺼내든 3野,” 조선일보, 2017년 2월 10일. “삼성그룹도 탈퇴…무너지는 전경련,” 한겨레, 2017년 2월 6일. “전경련 창립멤버이자 최대 물주인 삼성 탈퇴원 제출…해체 가속화하나,” 한국일보, 2017년 2월 6일.